Asking “What Would Disney Do?” yields record-breaking campaign for regional children’s hospital. Founded in 1908, Florida Hospital is one of the nation’s largest not-for-profit healthcare providers and the dominant player in its region. Part of Adventist Health, the faith-based system has 22 campuses serving communities throughout central, east and west Florida. Facing declining market share and low surgical volumes, Florida Hospital joined forces with Walt Disney Company to create a new children’s hospital, Florida Hospital for Children. This combination of one of the world’s leading children’s brands and the region’s leading healthcare provider was aimed at providing kids the most advanced clinical care in a setting that made going to the hospital a kid-friendly experience. Florida Hospital tasked bp|d to develop a strategic approach that would capture the imagination of the market and reflect the innovative nature of this historic partnership. It’s not every day that a hospital partners with one of the most recognized children’s brands in the world. 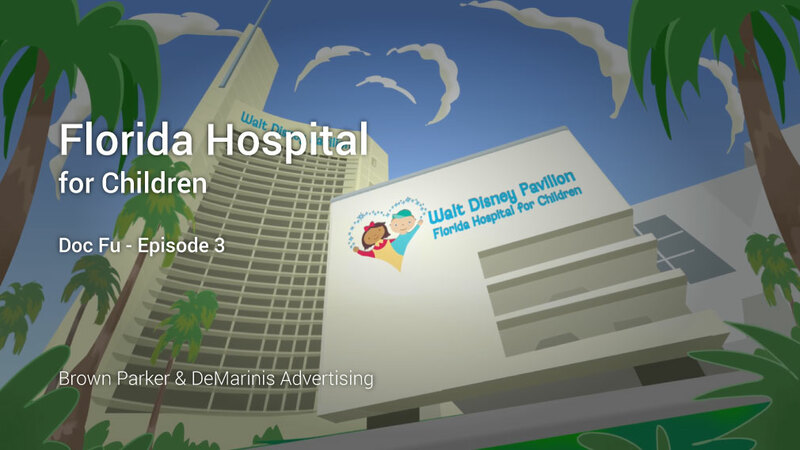 So we asked ourselves, “What would Disney do if they were opening this hospital on their own?” The answer was simple: They would market their brand to kids and, through them, capture the pocketbooks of the parents. 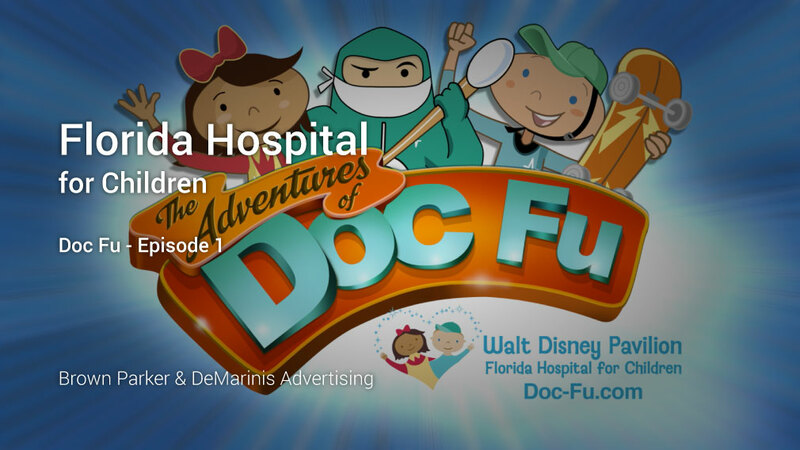 Our new Disney-like franchise, Doc Fu and The Health Team, took Orlando by storm. 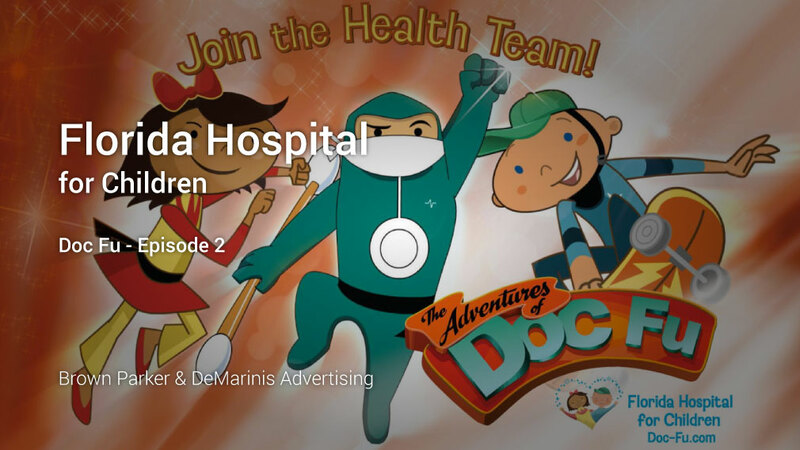 Two-minute cartoons featuring The Health Team battling The Forces of Misery played in movie theaters throughout the city and on the hospital's closed-circuit TV network. Doc Fu made regular visits to kids in the hospital, at schools and even NBA games. Trading cards (educational), stickers and t-shirts were given to kids as giveaways. Rooms in the children’s hospital were decorated with Doc Fu themes. Surgical volumes jumped nearly 36% in the first year. Our approach was not only well-received by kids, but showed physicians and parents that the brand understood this market. And the results have been nothing short of spectacular. Since the campaign’s launch in 2011, brand preference and surgical volumes have skyrocketed. Brand preference increased from approximately 5% to nearly 25%, and surgical volumes jumped more than 20%! Doc Fu and The Health Team has boosted preference, enhanced the patient experience and directly contributed to a dramatic increase in volumes across the board. Although it’s unconventional, it’s universally loved by administrators, clinicians, parents and, of course, kids.